Industry experts agree that social media possess tremendous potential to drive incremental revenue. But defining a business-effective social media strategy can be challenging for retailers who may be new to the channel and a bit skeptical of its potential to deliver on key business objectives. 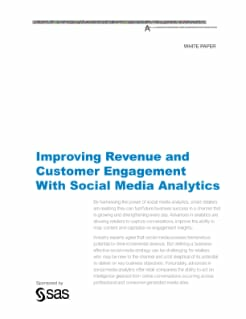 Fortunately, advances in social media analytics offer retail companies the ability to act on intelligence gleaned from online conversations occurring across professional and consumer-generated media sites.